The Spirit of Christmas Bk. 6 by Leisure Arts Staff (1992, Hardcover) ISBN-10: 094223717X ISBN-13: 9780942237177; The Spirit of Christmas Creative Holiday Ideas Book 6 1992 Crafts Holiday Food. 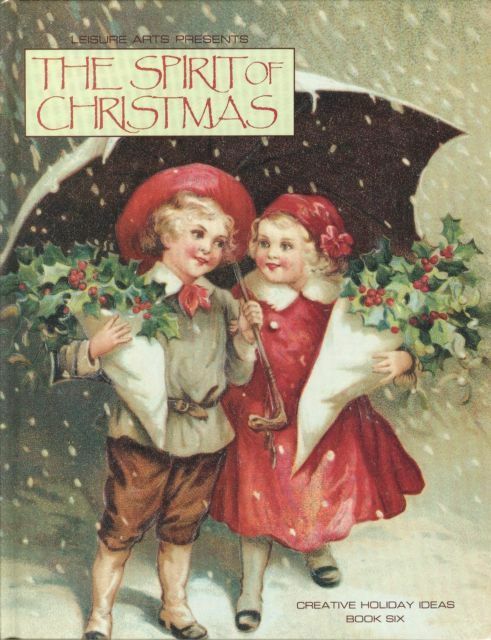 · Qty available-Only one in stock, order soon · Condition-Very Good · Publication Year-1992 Edition Description-ILLUSTRATED; Synopsis When Christmastime draws near, hearts fill with gladness as people everywhere come together to share the joy of the season. The spirit of love, inspired by the one whose birth we celebrate, encourages us to put a little of ourselves into every aspect of the holiday. The excitement of gathering trimmings for the house, the pleasure of planning festive meals, the thrill of discovering just the right gift -- all these things help us share the Christmas message with friends and loved ones. Time-honored traditions are passed from one generation to the next, strengthening our families and enriching our lives. As you prepare for the holidays this year, we hope the ideas in this book will enhance your family's celebration in a very special way. Book jacket. Product Identifiers ISBN-10 094223717X ISBN-13 9780942237177 Key Details Author Leisure Arts Staff Number Of Pages 160 pages Publication Date 1992-06-01 Language English Publisher Leisure Arts, Incorporated Additional Details Volume Number Bk. 6 Edition Number 6 Dimensions Weight 66 Oz Width 9.1 In. Length 11.4 In. Classification Method Dewey Decimal 745.594/12 A GREAT LEISURE ARTS BOOK LOADED WITH CRAFT IDEAS THAT YOU CAN MAKE TO MAKE GIFTS AND YOUR HOME MORE FESTIVE FOR THE HOLIDAYS. IT IS TITLED "THE SPIRIT OF CHRISTMAS CREATIVE HOLIDAY IDEAS, BOOK 6". THIS BOOK IS IN VERY GOOD CONDITION AND HAS APPROXIMATELY 160 LARGE PAGES OF EXCITING CRAFT IDEAS TO ENTERTAIN YOU AND YOUR CHILDREN. YOU AND YOUR CHILDREN WILL WANT TO USE THIS BOOK OVER AND OVER AGAIN. THIS BOOK MAKES A GREAT ADDITION TO ANY LIBRARY AND A GREAT GIFT AS WELL. Full of creative ideas for the holidays. 160 pages with full color photos. Crafts, recipes and home decor. This is the 6th book of the 20 year series. Crafts, decorating and cooking for the holidays. Patterns are full size. Crafts include cross stitching, embroidery, quilting, sewing, paper crafts more. Colored pics on most pages. Hardcover without a dust cover, good condition. REVIEWS: · Christmas book in a series, easy to use-The Spirit of Christmas 1995 book is chock full of ideas for Christmas, from decorations to homemade goodies. I purchased it to help complete my collection of the series. Because the books have full size patterns and very clear directions, I love making craft items from them. They are timeless and never seem to become outdated. The recipes are also excellent. I love the series and am anxiously searching for more in the series. · Get the Christmas Spirit Any Time of Year-Filled with vintage Christmas images and vivid color photos of projects in cozy settings, this book can get you into the Christmas Spirit any time of the year. There are holiday ideas for decor and gifts, both quick and elaborate. From a paper crafted village and nativity to a crochet table runner to beautiful decorations for your tree. There is inspiration for every room of your home. Add a cross-stitched embellishment to pj's for a thoughtful gift. There are even gift ideas for the family pet. Directions are clear and easy to understand, most patterns are full-size. Don't miss "The Tastes of Christmas" section. It is packed with both new and traditional recipes to tempt your taste buds. And make this your best Christmas ever. · I am a Christmas Nut and like to get ideas for decorating from many sources and many different years. They say what's old is new again so I try to find a new twist on an old idea. The Spirit of Christmas series is a good reference. · This is the third of 19 books in The Spirit of Christmas series they are a wonderful hard cover books with beautiful Christmas ideals. You really do need all 19 books. · These books have many ideas for craft items, gifts, and food for the Christmas holidays. Most seem to be very easy to make. I cannot wait to get started making things from these books. This Christmas we will have new foods because I will be making the recipes from these books. · I love these books. This was the only one I did not have in the series. So glad I could purchase it and complete the set. It is just as interesting and informative as its companion books. Many nice recipes and crafts to do. SEE ALL MY CHRISTMAS BOOKS, MAGAZINES, AND DECORATIONS.